The other day I was driving through a smooth countryside road in Thiruvananthapuram district’s Aruvikkara to visit the family of our domestic help who had suffered a bereavement when I came across a dainty bus stop. Perhaps, because it was noon and off-peak hours the neat but empty bus stop and the giant board atop it with a granite plaque next to it caught my attention. I reversed the car to take a closer look, my reporter habit kicking in, not forgetting to take a photograph too. After all, it is not every day that you come across a humble bus stop decked with a large masthead and an inscription in beautiful black glazed granite. My attention then turned to the writing on the bus shelter. 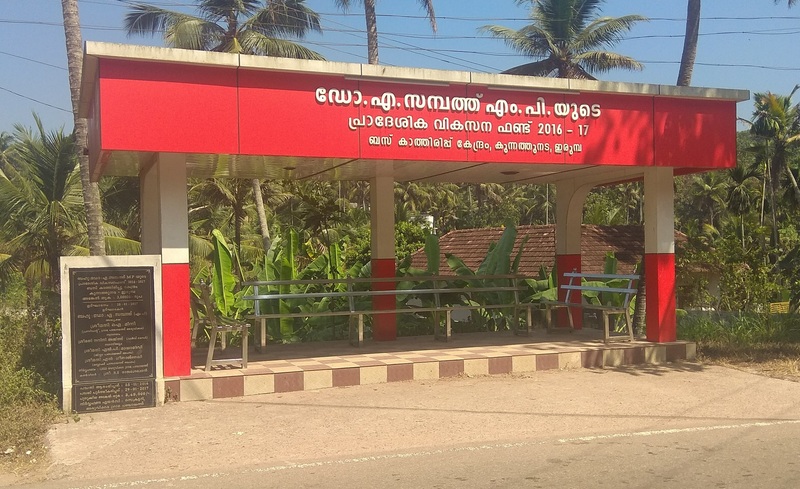 In Malayalam, it said “Dr A. Sampath MP’s Area Development Fund 2016-17, Bus Waiting Centre, Kunnathunada, Irumba”. The granite plaque repeated these details and also stated that a sum of Rs.3.65 lakh was spent on the project besides mentioning other local worthies who had graced the inauguration function. What then struck me was why a public work done with taxpayer money required such an oversized brandishing of the names of elected representatives. Even the prominent use of red, the colour of the Marxist party, was not lost on me. The irony of politicians using our own money to advertise their “generosity” in a grandiose manner struck me as duplicitous. Two weeks ago, my post on nonsensical free-wifi had offended the other MP from Thiruvananthapuram, Shashi Tharoor, whose MPLAD funds were used for such projects and he prominently tweeted his rebuttal. I have no objection to a small board announcing that a work was completed with MLALAD/MPLAD funds because it may be important for elected representatives to project the work they have done to the electorate. But the race to take credit amid stiff political competition will mean that boards keep getting bigger and bigger as in the present case. Perhaps, I am being old fashioned. In this age of self-marketing, the one who beats his drum loudest does earn bragging rights. Sampath is by most accounts a performing MP. In inflating the size of his name, and in splashing red all around it, he must have been doing his party’s bidding. After all, the Aruvikkara assembly constituency has eluded CPM for 28 years now. Given that Rs.6,590 crore of taxpayer money has been spent in Prime Minister Narendra Modi’s foreign trips and his government’s advertising blitz since May 2014, my gripe about a small country bus waiting shed may seem petty in comparison. But having seen small painted iron boards erected on roads, parks, schools, and dispensaries announcing MP/MLALAD funds the new level of marketing certainly jolted me. In the age of Modi, everything has to be supersized, in your face, and screaming for attention. Even the austere Marxists have latched on.